Perched on the Cape Fear River seaport, Wilmington (The Port City of the South) is one of the last great dames of the old south. You may even decide to take the old ghost walk and delve into the some of the exciting history that embodies the heart and soul of southern living. 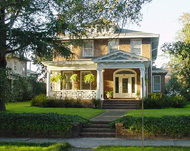 Port City Guest House is in the old mansion district of Wilmington, just 15 blocks from the heart of downtown. Built in 1915, all of the character and charm has been preserved and we want our guests to feel this is "their home away from home." We are one the most reasonably priced guest home in Wilmington and also provide special weekly rates in addition to our "Gold Member Club" rates.